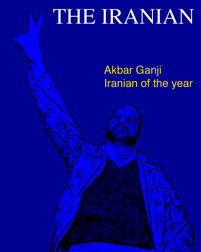 Akbar Ganji is the Iranian of the year, according to a survey conducted by iranian.com. Emails were sent to about 40,000 members of The Iranian mailing list last month, asking about their choice. Ganji, a reformist journalist sentenced to 10 years in prison for "undermining Iran's security", received nearly a quarter of the respondents' votes, more than any other person. Also see other Iranians of the year "Khatami, Googoosh & Pahlavi", "Notables" and "Etcetera". Akbar Ganji is my choice for Iranian of the year. As an Iranian, he has come to represent what Iranians admire most: courage, vision, perseverance, humility. (I vote for Akbar Ganji) for courage in reporting and commitment to democratic accountability. Akbar Ganji is the most prominent investigative journalist Iran has ever had. In a future democratic Iran his contributions will be openly and proudly acknowledged. My choice is Akbar Ganji because he symbolizes the struggle of the people, and the voice that can not be subdued. In short, if we fail to help people like him bring about change, then we have failed as a nation. His imprisonment is our imprisonment. Mr. Ganji showed great courage to expose the assassinations committed by the Ministry of Intelligence and the connection to high ranking Iranian officials. His imprisonment is the retaliation he gets for his services to the people by exposing the government's dirty little secret. Concerned citizens in Iran should do more to win his freedom and show show their solidarity and support for this Iranian patriot who has done great services for his country and the revolution. Demand Justice Not Retaliation. Akbar'e Ganji is the man with balls. It's a shame we have very few of this kind. My choice of Ganji as the Iranian of the year is not based upon his skill as a journalist but the fact that this so-called liberal journalist and others like him exposed the ugly nature of the Islamic regime once again. It just goes to prove that no matter who or which group is in power under molla's rule, they will not tolerate any differing or questioning opinions. It just shows that when push comes to shove, the so-called liberal President Khatami shows his true face as he did during the students' unrest; first he supported their cause but as it spread and threatened the very existence of the regime, he condemned the students as thugs and anti-revolutionary elements and allowed their violent suppression and shed crocodile tears for them later. In the case of these journalists too, Khatami prefers to shut up and say nothing which might endanger his position as the puppet head of a joke called the government of the Islamic Republic of Iran. Khatami's liberalism is a myth created by the regime to simply buy them time, just as the war with Iraq bought them time and gave them the chance to ruthlessly slaughter the people who opposed them. Khatami is one of them and it is a mistake to think of him as a savior. I am sure this year too he will get a big chunk of the vote cast through this poll. But time will show what a useless molla he was, as far as the welfare of the Iranian people is concerned. Down with the Islamic Republic in any shape and form! Mr. Ganji's revelations about Rafsanjani and the political murders will have a positive impact on future political discourse in Iran. Unfortunately he is paying the price for being one of the pioneers of the reform movement. Akbar Ganji was once a functionary in the Revolutionary Guards and the Ministry of Islamic Culture and Guidance. Now, Ganji challenges high authorities by name, accuses Iran's Intelligence Ministry of the murders of dozens of intellectuals and believes that people are constantly being killed because they know too much about the government's dirty dealings. Lately Ganji confronted ex-president Rafsanjani for having valuable information on the recent murders. By publishing one article after the other, he is the one who has finally pulled back the curtain. In other words, he dared to call Islamic authorities to account in a way no other Iranian journalist ever dared. He broke the biggest taboo by doing so and he could only do so because he has the public's support. Ganji knows though that his writings carry risks. His fights for reforms are lawful but dangerous at the same time. He has regularly received anonymous threats and he himself calls what he is doing "playing with death". But on the other side even some liberals fear that he is going too far. Morteza Mardiha, a columnist for the Teheran daily Asr-e-Azadegan commented on Ganji's mission that: "Sometimes reality is too harsh and unnecessary to be looked at." On April 22, 2000, Ganji was detained for his accusations concerning the 1998 serial murders. He said, "This is the price we pay for exposures in connection with the serial murders." AND THAT IS WHY I CHOOSE Mr. GANJI FOR THE TITLE OF "IRANIAN OF THE YEAR." (I vote for Akbar Ganji) for the way he stood up for his rights and the way he spoke out at his trial. he has outstanding courage and I wish him success! (I vote for Akbar Ganji) for resisting the easy path. My vote for Iranian of the year goes to Mr Akbar Ganji, an investigative journalist who triggered a new wave of resistance in Iran and demonstrated the colossal scale of the regime's thirst for violence. He is brave, honest and dedicated to his principles. These are the values that our society has but only a limited chance to face up to. He is the only one with guts to stand up and tell the truth in court. He is brave and committed to his cause. My Iranian of the year is Akbar Ganji, the courageous and bold writer. He sacrificed himself for the truth. I vote Akbar Ghandji as the Iranian of the year for his stamina in defending freedom of expression and choice in Iran, devastated by 22 years of theocratic and dogmatic rule. As a reformist he stays idealist, as a reporter he stays brave, as a political figure he stays honest, and as a prisoner he stays determined. He translates redemption for generations to come. I vote for Akbar Ganji for the most resilient voice of suppressed reform. My choice is Akbar Ganji for all he does and all he did during the recent years. He is a symbol of the unity of courage and intellect, the unity of patriotism and principles. I was impressed by Akbar Gangi's courageous revelations in his book "Aalijenaab-e sorkhpoush". Last year his fight for freedom of speech continued which resulted in his imprisonment. As an Iranian I am proud of his efforts and therefore I choose him as the Iranian of the year. Akbar Ganji has been imprisoned for bringing to light those behind the planned murder of Iranian intellectuals who were on a bus to Russia for a conference. Mr. Ganji, who turned his court appearance into a prosecution of the judiciary, should be the man of the year! My vote is for Akbar Ganji. He is a symbol of "mardaanegi va esteghaamat."